One of my hobbies is exchanging postcards through postcrossing. I have been a member for 5+ years and around the world many members get together for a meeting. 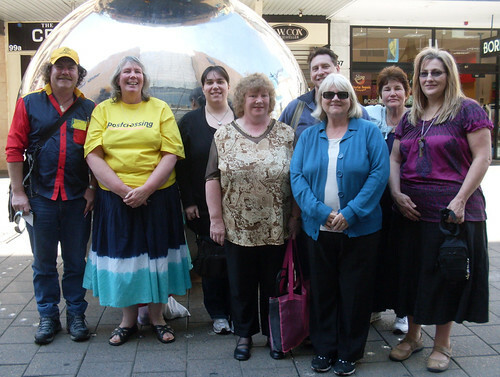 There had never been a postcrossing meeting before in Adelaide (my state's capital city and 100km away from where I live) but a few interstate postcrossers were visiting and a meeting was organised. 10 people showed up, 8 were postcrossers and 2 were non-postcrossers. 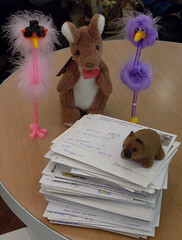 We had lunch in the city and signed 197 postcards to send to other postcrossing friends around the world. We bought postcards at the tourist shops and then headed down to Glenelg to buy more postcards. 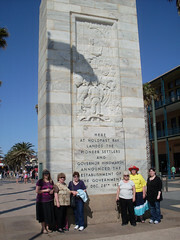 Some of the group went on the tram after a short tour of Adelaide. Glenelg was packed with visitors, the weather was perfect and sunny. 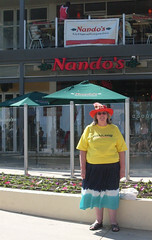 I spotted a Nando's restaurant and couldn't resist having my photo taken in front of this little bit of Portugal. Paulo and Ana the owners of Postcrossing are Portuguese. and the group had the obligatory picture taken in front of the monument. I had a great time and loved meeting up with the other postcrossers who were just faceless friends before. Very nice story about your Postcrossing meetup. I hope to attend one someday!